A hefty rainy season has caused the need for adjustments in the Volcano softball schedule. Games have been cancelled, postponed and rescheduled, but still the girls were able to get a couple wins under their belts toward the end of March before the first league game out of town April 9 with the Mercy Warriors. Stats on that league match in next week’s sports section. In the meantime, March 21 the Vols came out on top of the Portola Tigers by a score of 12-5. The girls were able to get in four innings. The Tigers took the lead in the first inning scoring five runs to Chester’s pair. The Volcanoes didn’t let the Portola girls enjoy the victory long, the Vols came back to score eight runs in the second inning and freezing out the Tigers to zero gain. In the third inning the Chester girls added two more runs and continued to ‘hold those Tigers to their runs in the first inning. Two runs each were scored by senior Kaela Wiseman, senior Emily Twitchell, senior Ashlyn Olah and sophomore Jordan Smith. Single runs were scored by freshman Chloe Wiseman, junior Skyler Jansen, junior Bailey Redican and sophomore Chancey Juska. Three RBIs were hit by Wiseman, two each by junior Kassie Nine-Squire and Olah and single RBIs came from Redican and Juska. Wiseman hit a triple and a double. Ohla and Redican also hit doubles for Chester. Chloe Wiseman, Smith and Juska all stole two bases. Kaela Wiseman, Twitchell and Jansen each stole a base, too. Freshman Chloe Wisemand and senior Ashlyn Olah pitched for Chester. Olah struck out one of the Portola batters in two innings. A second win followed for the Volcanoes that same day as the girls took on the Maxwell Panthers, victorious 5-0. No scoring took place for either team the first four innings and it wasn’t until the bottom of the fifth that the Volcanoes got on the scoreboard with a single run. Holding the Panthers firm, the Vols scored four big runs in the sixth inning to end the game. Runs were scored by Kaela Wiseman, Bailey Redican, Jordan Smith and Chancey Juska. RBIs are credited to Skylar Jansen, Chancey Juska and four to Ashlyn Olah who hit a double. Smith stole two bases. Olah held the mound for the whole game facing 26 batters and striking out seven. The Tigers were only able to get four hits off Olah during the game. Chester’s final game at the Biggs tournament took place the morning of March 22 facing the Etna Lions, roar! The giant cats shredded the lady Volcanoes 16-0. Top batters for Chester, Ashlyn Olah, Kaela Wiseman and Bailey Redican were unable to cross home plate. 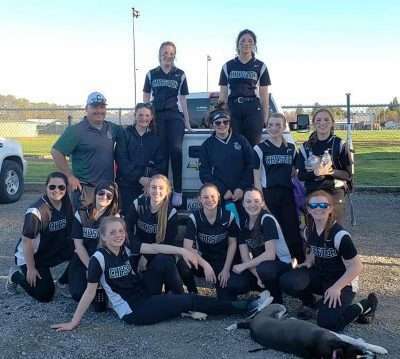 Launching into April the CHS softball team traveled to Biggs again for a doubleheader with the Wolverines on their home turf. The Vols lost both games, 19-9 and 12-1, but some good plays were executed and the girls got in good practice against a tough team before league play began. In game one, Chester kept pace with the Wolverines to tie 2-2 in the first inning. Then the clouds parted and the rain came tumbling down, figuratively. The Wolverines scored seven runs in the second inning, holding the Vols to zero gain. The third inning, the CHS girls were back in the game scoring two runs to the Biggs three and did even better, matching Biggs three for three in the fourth inning. In the final fifth inning the CHS team scored two more runs and Biggs added four. It was a good game and the Chester girls did great sticking to the job at hand no matter what the score. Two CHS runs were scored by Ashlyn Olah, Bailey Redican and Chancey Juska. Single runs were scored by Kaela Wiseman, Chloe Wiseman and junior Hanna Zuniga. Juska hit three RBIs, Nine-Squire and Olah hit two each and Jordan Smith hit one RBI. Olah and Juska both hit home runs in the game! Redican and Juska hit doubles. Chloe Wiseman and Jordan Smith were able to steal bases. Senior Emily Twitchell returned to the mound with assistance from freshman Chloe Wiseman. Twitchell faced 23 batters and Wiseman pitched to 18. In game two (12-1 Wolverines) of the Biggs doubleheader, the lone CHS run was scored by sophomore Chancey Juska with the RBI coming from Skylar Jansen. Juska also stole a base from the Wolverines. Ashlyn Olah pitched the whole game, four innings, striking out one of the Biggs batters. Olah threw 108 pitches to 33 batters. The Volcanoes went on the road for their first league game April 5 to Los Molinos and then April 9 to Mercy. They have a non-league doubleheader at Big Valley tomorrow, April 11, and then another away game in Redding April 23. Then they will finally return home Friday, April 26, to face the Mercy Warriors once again at 4 p.m.
A doubleheader with the Portola Tigers follows the next day in Chester with games starting at 1 and 3 p.m.
5/1 Los Molinos 4 p.m.
5/7 Fall River 2 p.m.